I moved not too long ago. 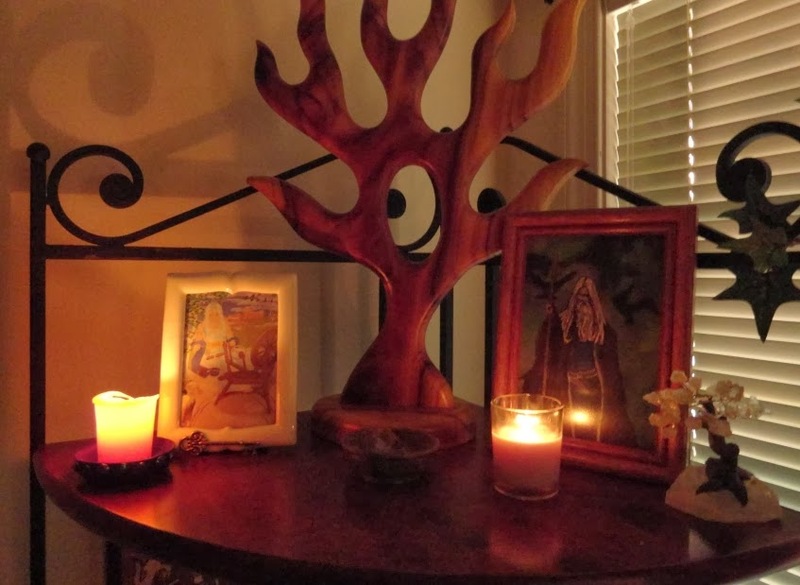 Back at the old place, dismantling the old altars turned into a quietly moving experience in itself: it is definitely worth pausing for a bit to thank the Gods and Goddesses for the blessings They have given before packing up one's altar pieces. I actually had a curious sensation of many hands lightly touching my own as I prayed for the final time at the old altars. There is also a new wall shrine to Forseti, my fulltrui. This is quite visible as soon as one walks in the door; it is located in the very center of the new home. I very much like that symbolism. The top plaque is simply a printed parchment on stained wood, which I once put together to go with the main altar piece below. It reads: "Hail Forseti, Builder of Bridges, Stiller of Strife, God of Frith and Truth." 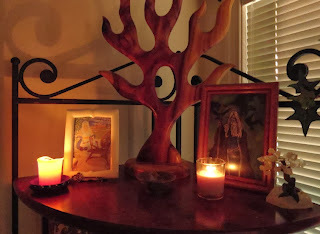 The far more elaborate woodburnt icon of Forseti on the small table was made by Debra Arnold. It is definitely one of my favorite images of Him. This piece shows Him sitting with axe in hand and has a number of hailings for Him written in runes along the border. Moving certainly takes a lot out of a person. Supposedly, it is one of the most stressful of life events. I think that I can very much believe that, especially lately. I still have a bit more setting up to do, but the altars have already gone a long way towards making this new place feel like a home. Congratulations on settling in. The altars are beautiful. Thank you very much on both counts. I am glad that you enjoyed the altar photos.